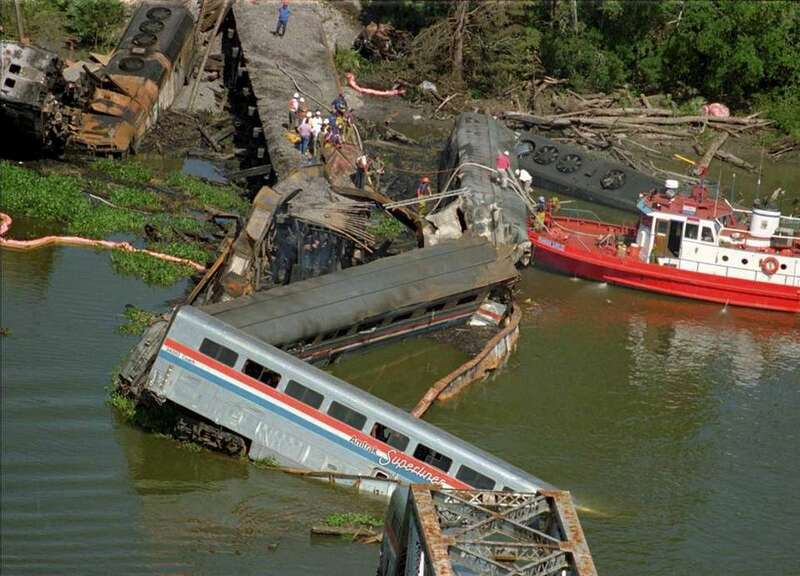 A look at 10 deadly mass transit disasters in the U.S. 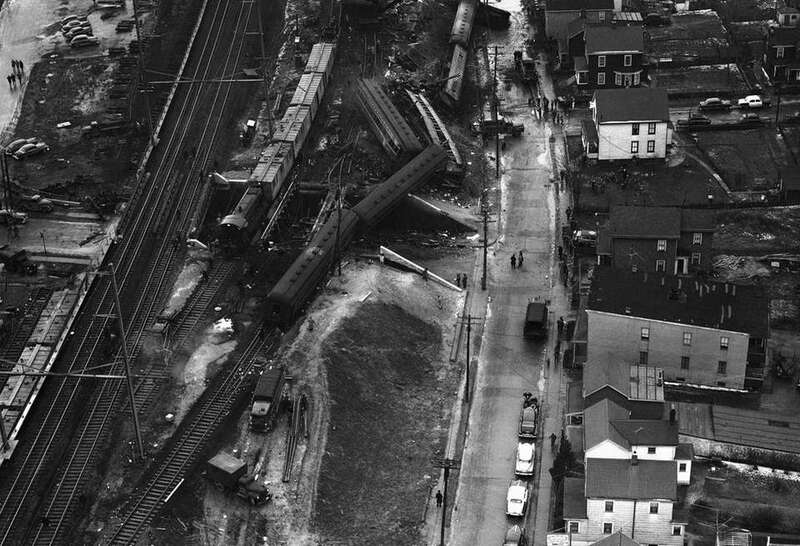 This low-level aerial view of the wreckage of the Pennsylvania Railroad's commuter train shows where coaches left the tracks and toppled from a temporary wooden overpass at Woodbridge, New Jersey on Feb. 6, 1951. At right are the cars that went down the embankment. Car at center right is one in which most of the 84 people who lost their lives were trapped. Main tracks are on the left. Emergency crews and others gather at the scene of the Long Island Rail Road's worst crash. 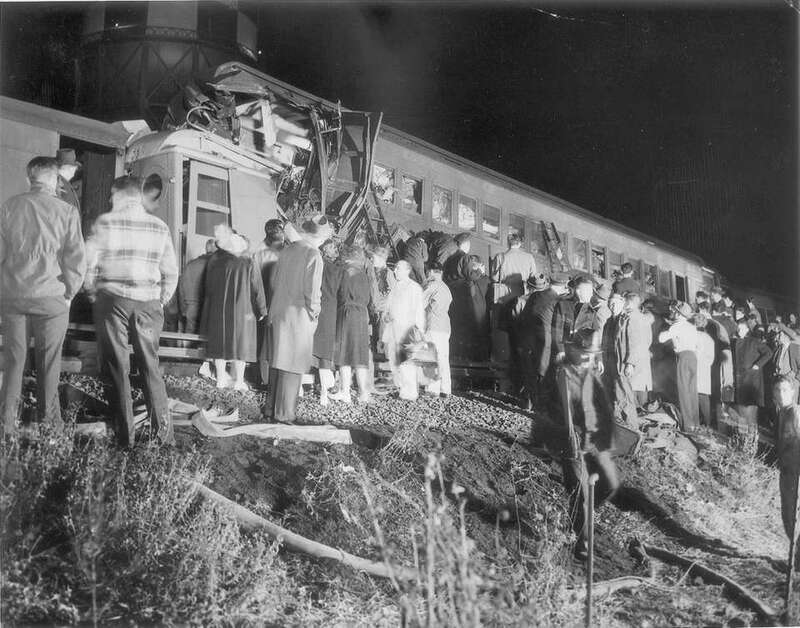 A train that had stopped in Queens was rammed by one bound for Babylon on Thanksgiving Eve Nov. 22, 1950, killing 78 riders. An aerial view of the wreckage of the Amtrak Sunset Limited that plunged off a bridge into a bayou north of Mobile, Ala. on Sept. 22, 1993. A barge rammed the bridge, causing the derailment. Forty-seven people were killed – 42 passengers and five crew members. On Feb. 17, 1950, a Babylon-bound Long Island Rail Road train left a double track and switched to a temporary one-way track that was being used during the elimination of grade crossings. 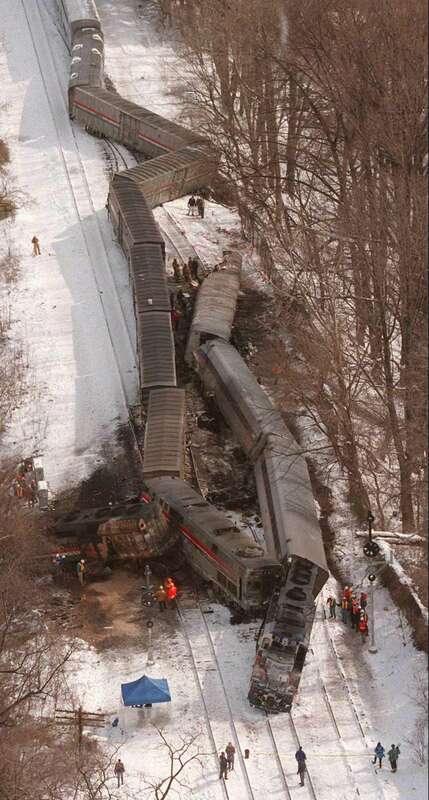 It and a New York-bound train running on the same track collided head-on in Rockville Centre, killing 31 people. 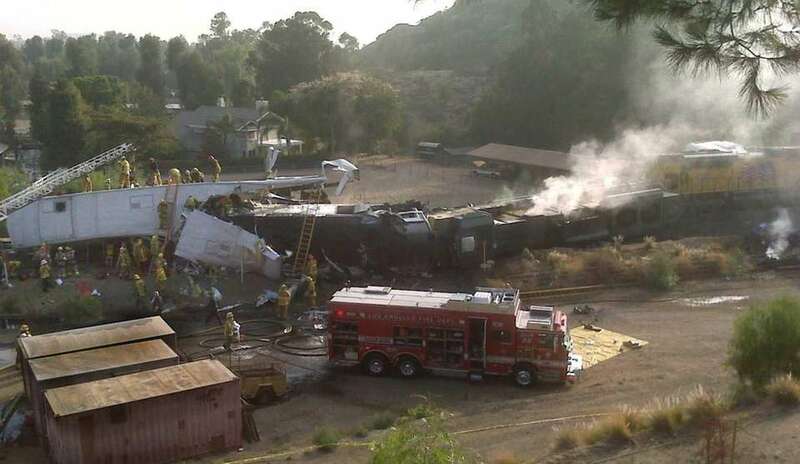 Rescuers attend to the injured after a Metrolink passenger train and a Union Pacific freight train collided in Chatsworth, Calif. on Sept. 12, 2008. Twenty-five people died as a result of the crash, which occurred after the Metrolink train did not heed a warning light. 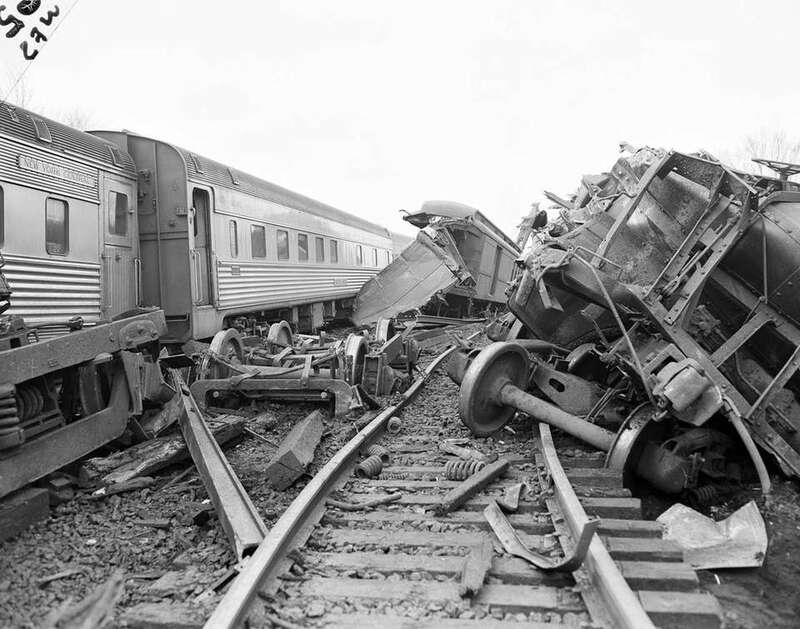 Twisted cars and rails of the New York Central are strewn about after a multiple-train collision near Conneaut, Ohio, on March 27, 1953. A total of 21 people died. 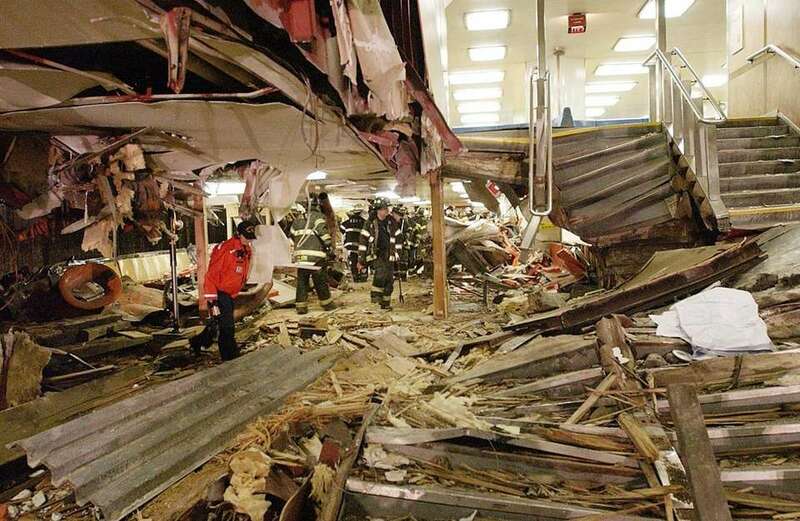 Destruction to the Staten Island Ferry boat Andrew J. Barberi, which was involved in a fatal accident at the ferry terminal on Staten Island on Oct. 15, 2003. A ferry packed with commuters slammed into a pier, leaving 11 people dead. The MARC commuter train, right, and an Amtrak train that collided Friday night, Sept. 16, 1996, in Silver Spring, Maryland, are seen in this aerial photo taken after the crash. 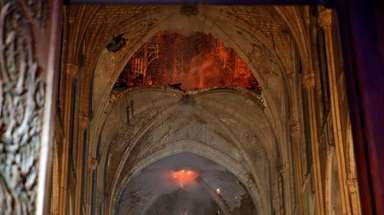 The fiery crash killed 11. 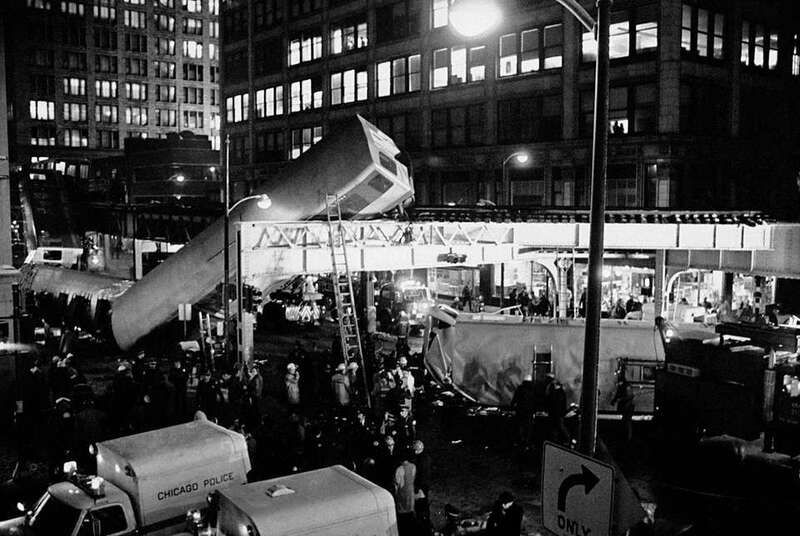 This was the scene in Chicago's Loop Feb. 4, 1977 following the crash of a Chicago Transit Authority elevated train. 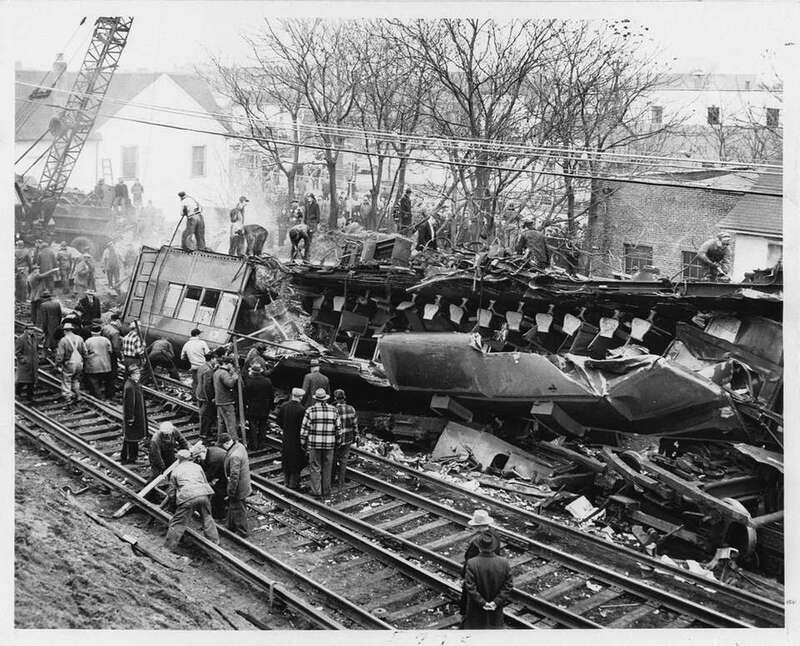 Three cars of the eight-car train fell to the pavement, killing 11 people. 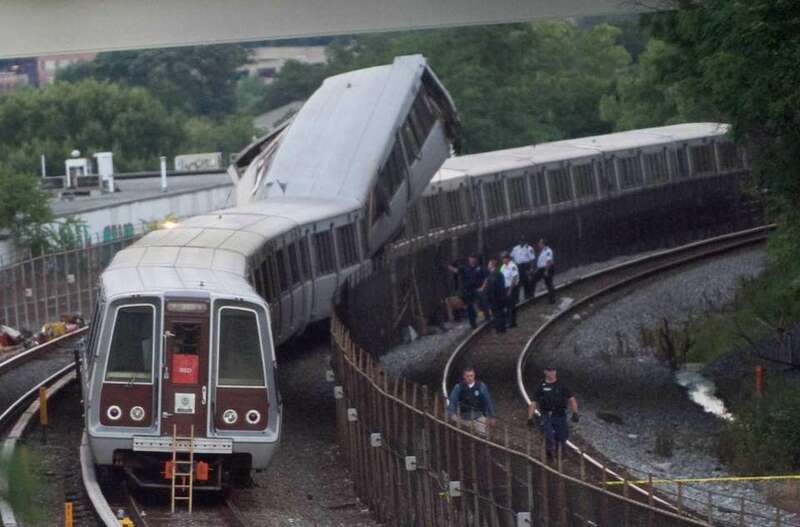 2009: Subway collision in Washington, D.C. Emergency personnel investigate the scene of a Metro subway train collision in Washington, D.C. on June 22, 2009. Nine people were killed in the rush-hour collision between two Metro trains in the nation's capital.